Australian born, globally worn. Cotton On delivers its own take on current trends, paired back to reliable basics, to create effortless and affordable style. Shop our value-fashion ranges for clothes that are meant to be lived in every day. Great fashion, t-shirts, jeans, tanks, skirts, cardies, shoes, intimates, accessories, kidswear and the lot. CouponSurfer Rewards members get 5% cash back in-store. Just Click to Activate Offer. 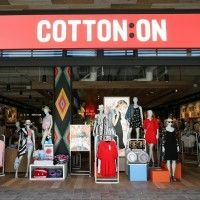 Find a Cotton On Store near you.